The Wolters Kluwer company develops and produces the Bankers Systems line of legal documents. Until recently, the only way to print these forms using Frazer was to purchase the hard copy editions of the documents and use your Frazer system to print information into the correct fields. 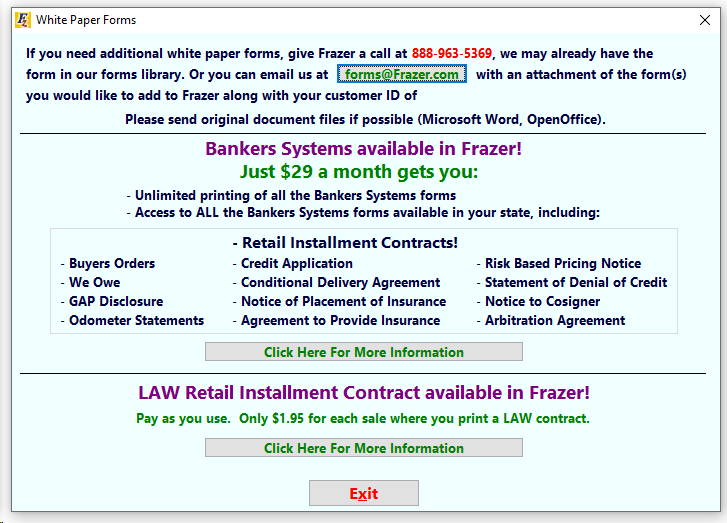 Now, Frazer has released an integration which allows our customers to print Bankers Systems forms directly to your laser printer for just $29 a month. To See a list of available Banker Systems forms, click on the forms printing button in your Frazer and then on the “More White Paper Forms” button . In order to activate your Wolters Kluwer/Bankers Systems subscription call Frazer at (888) 963-5369.